You must see this rare and unique full size SUV. This 2010 LEXUS GS460 is one of the few SUV with a true body on ladder frame construction making it one of the most durable SUVs in the world. Well sought after in the full size luxury truck market. This truck has had only one owner. 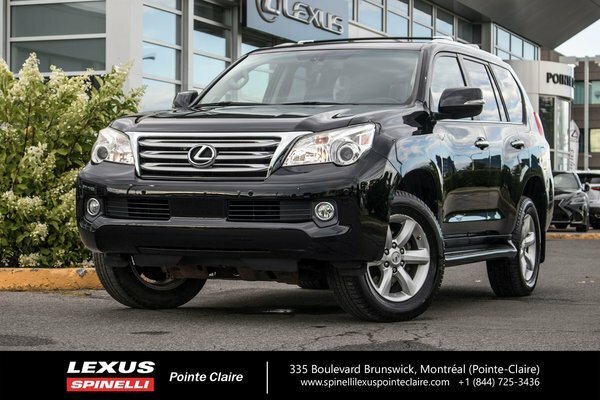 It was purchased new and serviced at Spinelli Lexus Pointe-Claire. The customer had installed brand new brakes on all 4 wheels and they have 90% life left. Inspected by our certified Lexus service department. We invested over $1000 in reconditionning, filters, fluids, etc....so you don't have too. Carproof and Lexus vehicle history reports are available. This is the Premium model which is well equipped with features like leather interior, heated and ventilated front seats, room for seven passengers, powerful yet economical 4.6L V8 engine, Kinetic Dynamic Suspension System KDSS, A-TRAC Active Traction Control, AWD, back up camera, navigation, memory seat, power tilt and telescopic steering, trailer harness and much more. Engine : 8 Cylinder Engine 4.6L - 8 cyl.